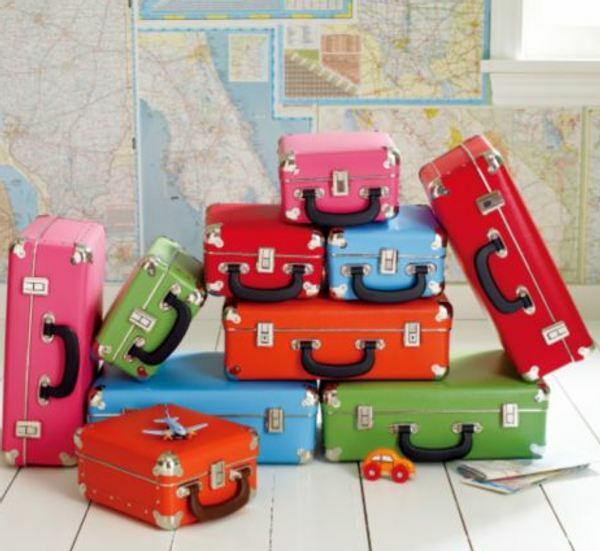 The second I laid eyes on these captivating retro suitcases, my mind went straight to my own little case from the late seventies. My mum happened to bring it to me last time she visited so I snapped a shot of it for you to see… yes they called me Suzette when I was three! Modelled on the cases of the 1950s, the Weekender range of suitcases from The Land Of Nod comes in two sizes to suit varied purposes. The Junior size would be great for preschool or to hold a kit of toys for a car trip. I can also see it as a great storage case for toys which have thousands of infuriatingly tiny pieces. The Regular size could be an overnight bag and a good-looking toy storage chest. I love the silver metal corners and the sturdy latches. I’m sure they’ll age even better than my little case after some thirty years have passed! The Junior is US$24.95 and the Regular is $39 plus shipping, from The Land Of Nod.